The face of a regular client at the Republic County Food Bank may look different than many people imagine. Caring Neighbors provides a regular, bi-monthly package of commodities to clients enrolled in the program. On the alternate months, clients are encouraged to participate in the distribution of government commodities at the Republic County 4-H Building. In January, the Republic County commodities distribution served 157families which included 376 individuals. 29 percent have more than one person over the age of 60. 50 percent contain a disabled individual. Janet Heyka, who volunteers to help distribute government commodities says those percentages reflect what she sees of people who use food services in Republic County. “Guessing from those I see coming to the 4-H building to pick up commodities in Belleville, I believe your statistics are in the ballpark,” she says. Food for the commodities distribution is purchased by the USDA depending on the preferences of states and market availability says the USDA. The amount of food each State receives out of the total amount of food provided is based on the number of unemployed persons and the number of people with incomes below the poverty level in the State. Recipients sign a statement declaring that their monthly income is at or below the level required by the Kansas Department of Children and Families, which administers the program in Kansas. The most recent local distribution for the Belleville area was last week. Other Republic County communities have their own organized distributions. Items in the March distribution will include figs, mixed fruit,green beans, pinto beans,long grain rice, beef stew,split peas, vegetable soup, Great Northern beans, fresh apples, fresh oranges, tomato sauce,frozen chicken, frozen pork loin roast. “If they get a lot from commodities, one elderly person can’t eat thatmuch in a month,” shesays. Rauch says many ofthe people over the age of65 enrolled in the Caring Neighbors programhave only Social Securityincome. In January 65 familiesreceived Caring Neighbors packages from theFood Bank. In Augustthat number was 81 families with 166 people; inOctober, 55 families/125people received food. Rauch said Caring Neighbors families rangein size from one to sixpeople. People must beresidents of RepublicCounty to access the services of the Food Bank, she said. The Food Bank also provides emergency foodassistance to householdsnot enrolled in the CaringNeighbors program onetime a month. 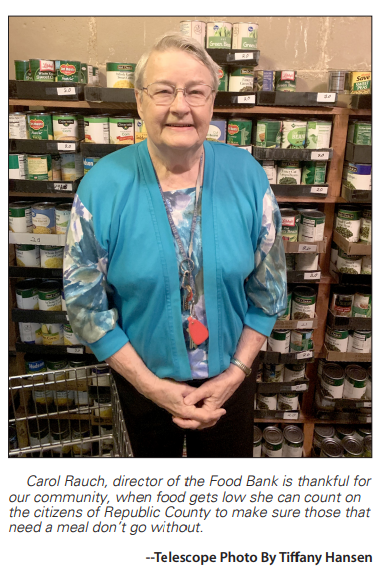 If an individual or family accessesthe Food Bank threemonths in a row, they areconsidered for enrollmentin the Caring Neighborsprogram, she said. All the food that stocks the shelves in the Food Pantry is donated by Republic County residents, Rauch says. “We do not get any government help,” she says. “It is strictly the good people of Republic County.